NEW YORK —It looks a bit like a hashtag, but it’s 73,000 years old. And scientists say this tiny sketch found in a South African cave is the oldest known drawing. It’s not the earliest deliberate design; some abstract engravings are far older. But the drawing shows early humans in southern Africa could produce designs on various surfaces with different techniques. The collection of crisscrossed lines was found in the Blombos Cave about 190 miles (300 kilometers) east of Cape Town. It is at least 30,000 years older than any other known drawing, researchers say in a report released by the journal Nature on Sept. 12. It was created with a sharpened flake of ochre, a pigment widely used in the ancient world, said Christopher Henshilwood of the University of Bergen in Norway. The drawing is basically six red lines crossed by three other slightly curved lines. It appears on a tiny flake of mineral crust measuring only about 1.5 inches (39 millimeters) long and about half an inch (15 millimeters) tall. It’s evidently part of a larger drawing because lines reaching the edge are cut off abruptly there, researchers said. The drawing was apparently made before the flake was deliberately struck off of a grinding stone used to make ochre powder, Henshilwood said in an email. Similar patterns are engraved in other artifacts from the cave, and the hashtag design was produced widely over the past 100,000 years in rock art and paintings, he said. So the newly found sketch is probably not just a collection of random scratchings. “It almost certainly had some meaning to the maker, and probably formed a part of the common symbolic system understood by other people in this group,” he said. 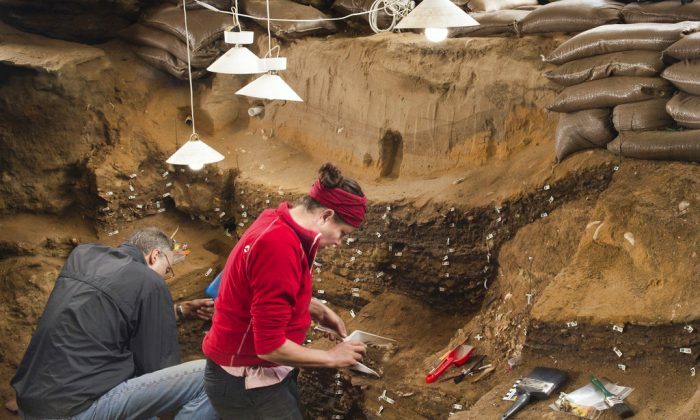 The finding gives evidence that early humans could store information outside the brain and supports the argument that early members of our species “behaved essentially like us” before they left Africa for Europe and Asia, he said. Silvia Bello, a researcher at the Natural History Museum in London who didn’t participate in the study, called the finding important. “It further shows how rich and complex human behavior already was 73,000 years ago,” she said in an email.